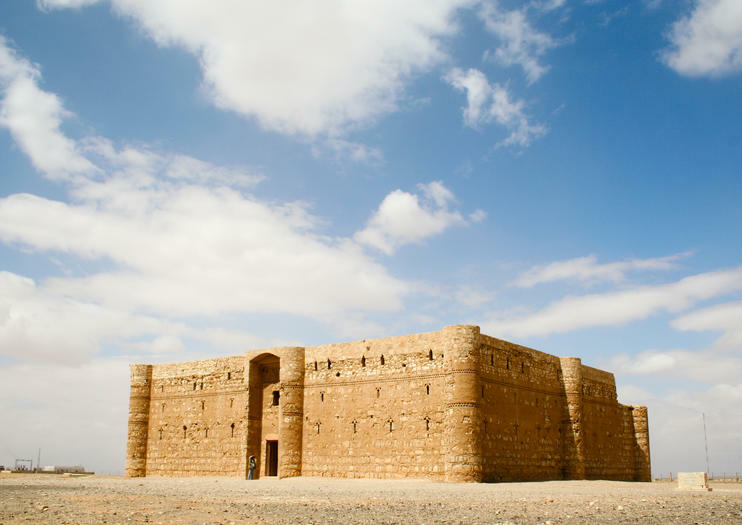 A true “desert castle” near the Saudi Arabian border, Jordan’s Qasr Kharana sits two storeys tall over the desert plain. Built in the early Umayyad period 13,000 years ago, the purpose of the 60-room monolith is unclear — its design shows that it was never a fort, and it’s not on a trade route so it’s unlikely to have been a caravanserai either. It’s most likely that Qasr Kharana was a meeting space for Damascus elite and local Bedouin tribes. Whatever it was, the thick-walled limestone building remains imposing even today. Excellently restored in the 1970s, its location in the barren desert makes Qasr Kharana one photogenic place. As you explore the upper rooms set around the large courtyard with a rainwater pool in the middle, look out for ancient Arabic graffiti. Just inside the entrance, learn more about Qasr Kharana from the interpretive plaque which is in both English and Arabic. Sixteen km west along Hwy 40 from Qusayr Amra, Qasr Kharana is run by the Jordanian Ministry of Antiquities, and its visitor center has a permanent display on local history. Admission costs JD 2, which includes entry to the desert castles Qsar al-Azraq and Qsar Amra as well. Discover three of Jordan’s famous desert castles on this 4-hour private tour from Amman. With an informative private driver, learn about these fabled castles, built by Umayyad rulers during the 7th and 8th centuries as you visit each one in the desert plains of eastern Jordan. Explore UNESCO-listed Qusayr Amra, famous for its 8th-century frescoes of hedonistic scenes, before continuing to the atmospheric Qasr Kharana and Qasr al-Azraq castles, the latter used as a military base by TE Lawrence, known as ‘Lawrence of Arabia,’ during World War I.